I am always on the hunt for the ultimate chocolate cake recipe. The 5 year anniversary of our first date was on the 16th, and we’re making a lazy celebration weekend out of it (this week was long and not so great for both of us). So yesterday I made this cake, and we both agreed that it’s the best chocolate cake I’ve ever made. The vanilla frosting is exceptionally rich and buttery, and I’m not always a fan of that. It was delicious, but there is a lot of it. So next time I make this I’ll probably use one of the other frosting recipes I love, and it’ll probably be a chocolate frosting. But I don’t make layer cakes that often, so it’s still a treat we’ll be munching on all weekend. Especially after the Sunday dinner I’ve got planned for today–grilled steaks and the mac ‘n cheese recipe I have finally perfected (more on that later this week). Both recipes are from The America’s Test Kitchen Family Cookbook, which I use to death. The recipes in it are phenomenal, and many of our favorite dinners are from this book: Skillet Penne with Chicken and Broccoli, for example. Here’s the cake recipe. 1. Adjust the oven racks to the upper-middle and lower-middle positions. Preheat oven to 350 degrees F. Lightly coat 3 8″ cake pans with nonstick spray and line the bottoms with parchment paper (I also spray the parchment paper, a trick from Martha). 2. Whisk the flour, baking soda, baking powder, and salt together in a large bowl and set aside. 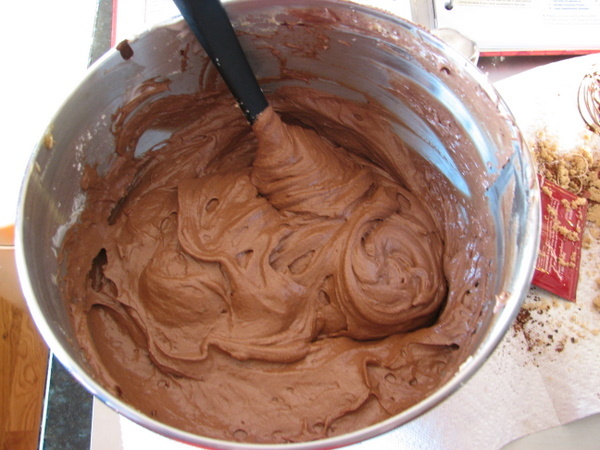 In another bowl, mix the cocoa powder, chopped chocolate, instant coffee, and boiling water until it’s smooth. 3. Beat the butter and sugar together in your stand mixer bowl (or with an electric mixer) on medium speed for 3-6 minutes–until it’s light and fluffy. Beat the eggs in one at a time and scrape down the sides of the bowl. Beat in the sour cream and vanilla. 4. Reduce the speed to low and beat in 1/3 of the flour mixture. Beat in half the chocolate mixture, then half of the remaining flour mixture, then the rest of the chocolate mixture, and then the last of the flour mixture. 5. Stir the batter with a rubber spatula to make sure everything’s incorporated. 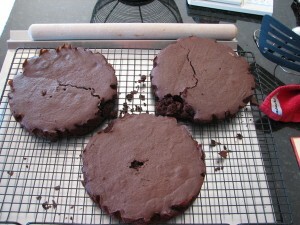 Divide the batter evenly into the 3 cake pans. 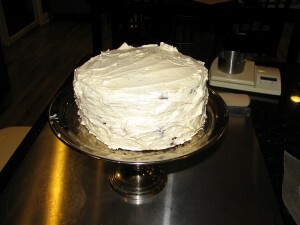 It’s really important to divide up the mixture as evenly as possible, or your layers will be uneven and bake unevenly. Place the cake pans on the 2 oven racks and bake until until a wooden skewer comes out with crumbs on it (not liquid batter). The original recipe says this takes 15-20 minutes, but it actually took me more like 30-35. Rotate the pans around on the racks at least once during baking. 6. Let the cakes cool in the pans for 10 minutes and then flip them over onto a wire rack. Remove the parchment paper from the bottom and then flip them right side up onto the racks. Let them cool there for 1 to 2 hours, until they’re really completely cool (the cake falls apart if you don’t do this step). Mine fell apart a little when I took them out of the pans, but I still got the cake put together just fine. Stir the cream, vanilla, and salt together in a small bowl until the salt dissolves. Beat the butter with an electric mixer on medium-high until it’s smooth, 30-60 seconds. Reduce the speed to medium low and slowly add the confectioner’s sugar. Beat until smooth, about 2 to 5 minutes. Beat in the cream mixture and increase the speed to medium-high. Beat until the frosting is light and fluffy, 4 to 8 minutes. 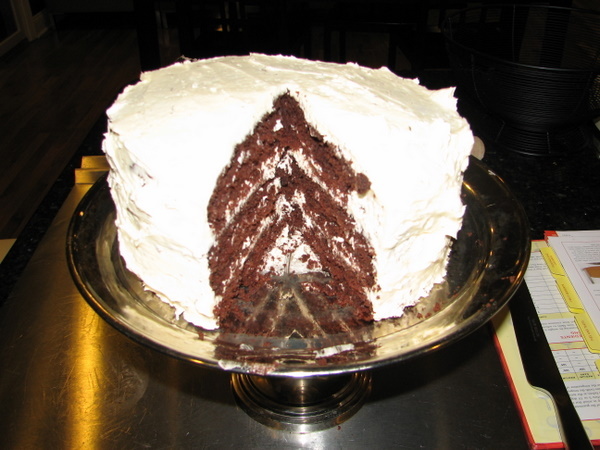 There are tips in the book to help frost the cake, but mine doesn’t look anywhere near as perfect as theirs does. I don’t have an offset spatula for one thing, and I’ve decided I really need to get one. But here’s the final delicious result.